Founded in 2005, originally playing Classic Hard Rock/Metal in the vein of Deep Purple, and Whitesnake, Max Pie gradually evolved into the Progressive Heavy Metal band they are today, characterized by extraordinary power and epic melodies. Like most bands Max Pie underwent a number of unavoidable line-up changes but kept on writing, rehearsing and step by step building a loyal following thanks to a rigorous touring schedule and impressive stage presence. The original member Tony Carlino (singer) was joined and renforced by Sylvain Godenne (drums), Damien Di Fresco (guitars) and Lucas Boudina (bass guitar). With this powerful line-up inspired by Dream Theater, Symphony X, ... Max Pie is now creating his most inventive and ambitious material ! In 2009, they started to write original songs, following this, in 2011, their first album, initial Process was released. The band performed their first album on tour as support with Jon Oliva's Pain in 2012. 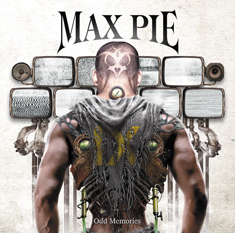 In 2015, Max Pie makes his return with a brand new album : Odd Memories. This one is more progressive, more melodic and powerful than ever. March 2016... Due to some changes in Damien’s life and not to impede the progress of the band, we decided by mutual agreement to stop our collaboration. April 2016... Thibaut Basely is confirmed as the new guitarist and permanent member of the band ! The new line-up is stronger than ever, ready to hit the stages. Some new songs are already written and the material to produce a new album will probably be ready for the end of this year. Stay Tuned !